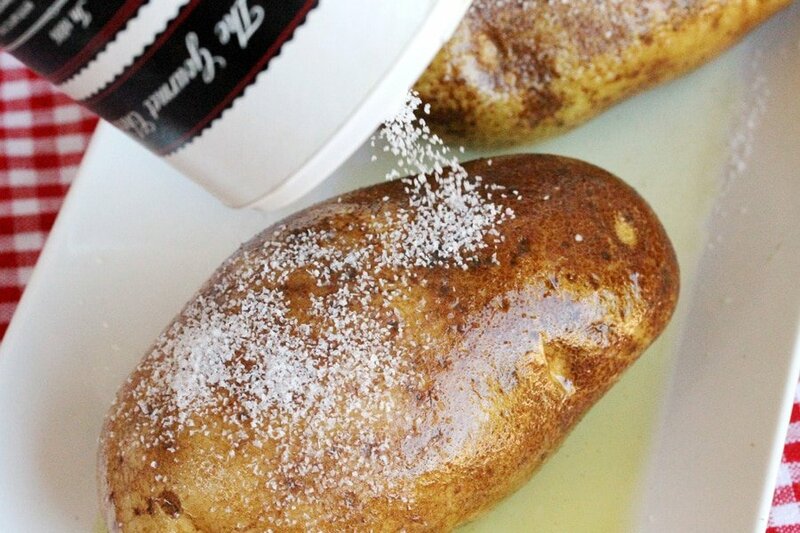 Salt crusted baked potatoes are so good and they smell amazing when they’re cooking too…a lot like french fries. 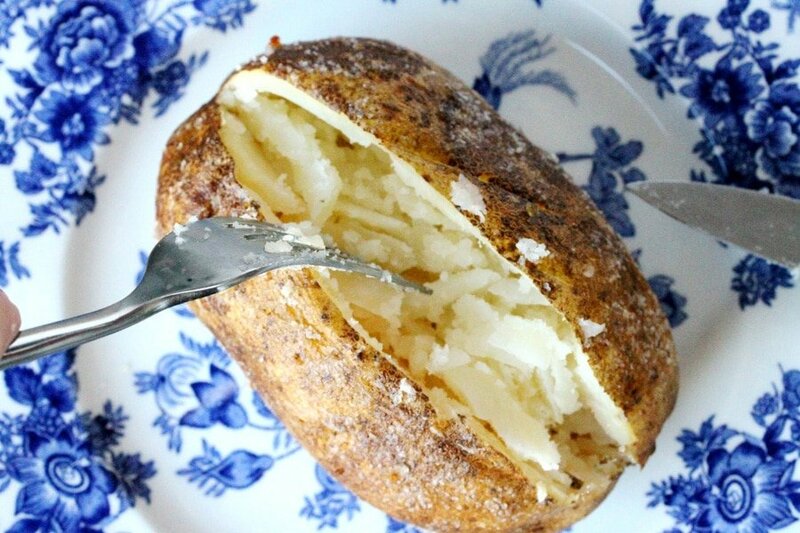 And with the outside of a baked potato tasting so good, it only seems fitting that the inside of a baked potato should be filled with something delicious too. 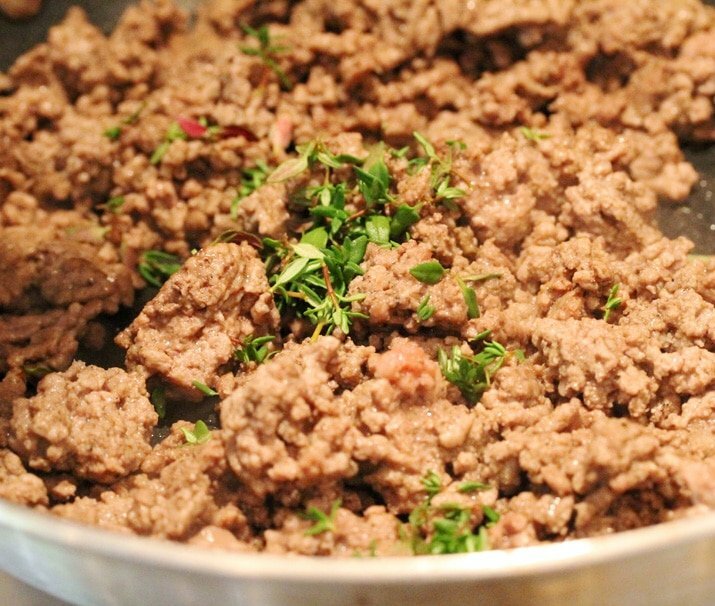 Like ground beef seasoned with thyme in a homemade gravy for example. 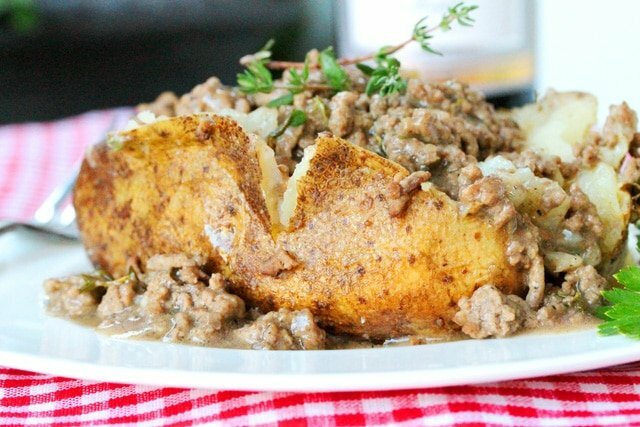 In this recipe, while the large salt-crusted baked potatoes are cooking, so is a skillet with lean ground beef, fresh thyme and other seasonings. 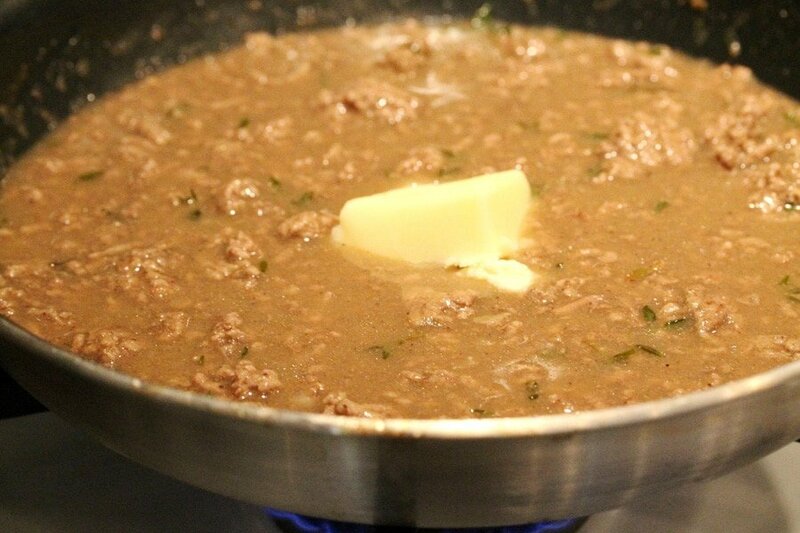 Then beef broth is added to the skillet along with a slurry made with flour to thicken the mixture and form a quick and easy gravy. 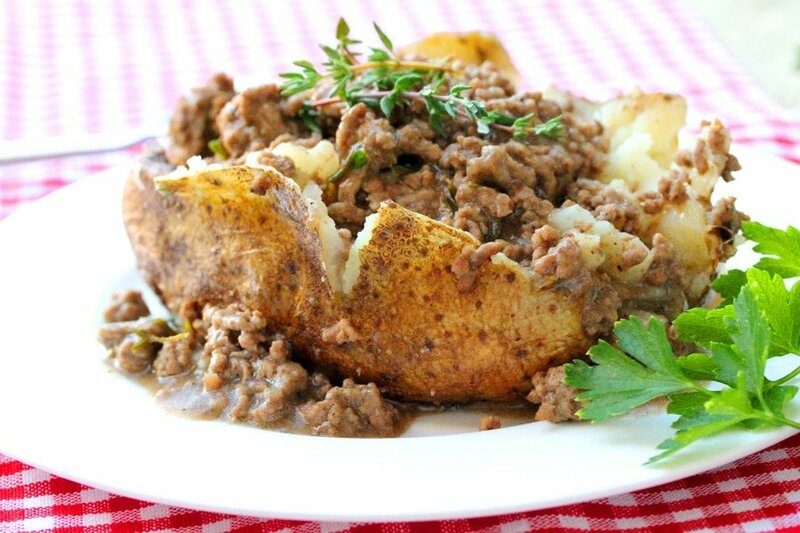 The baked potato is cut on top and fluffed up a bit so that the thyme ground beef and gravy mixture can be poured on top. A match made in heaven which can be served as a main dish along with a salad or all by its scrumptious self. 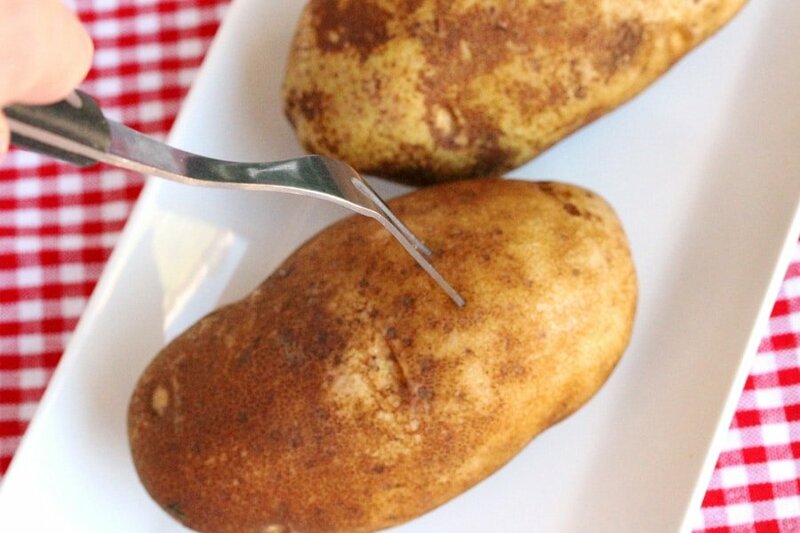 With a cooking fork, carefully poke holes in the potatoes. This cooking fork was my grandmother’s. You know what she used it for? She made the best fried chicken in the whole world with it….here’s the recipe “Simple Fried Chicken“. Every time I use this fork I have an image in my mind of her hand holding that fork turning the chicken as it was frying. 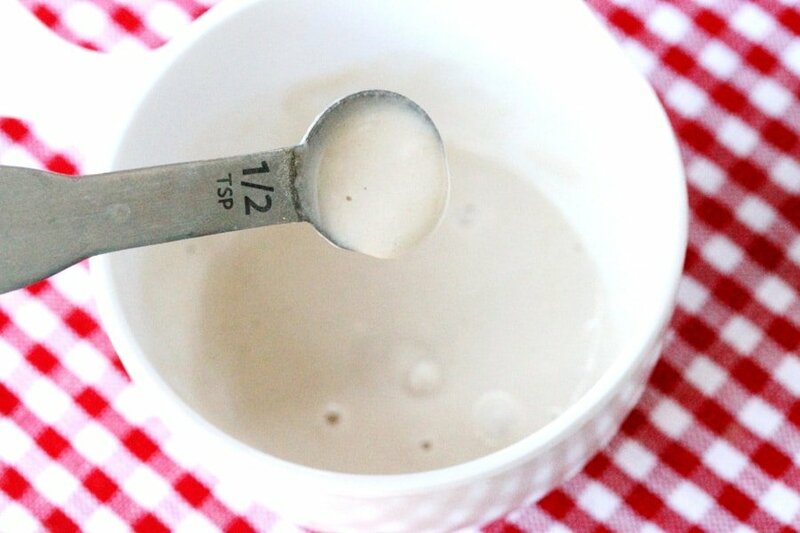 Funny how things can stick in your mind……yet I can’t remember how many teaspoons are in a tablespoon to save my life. 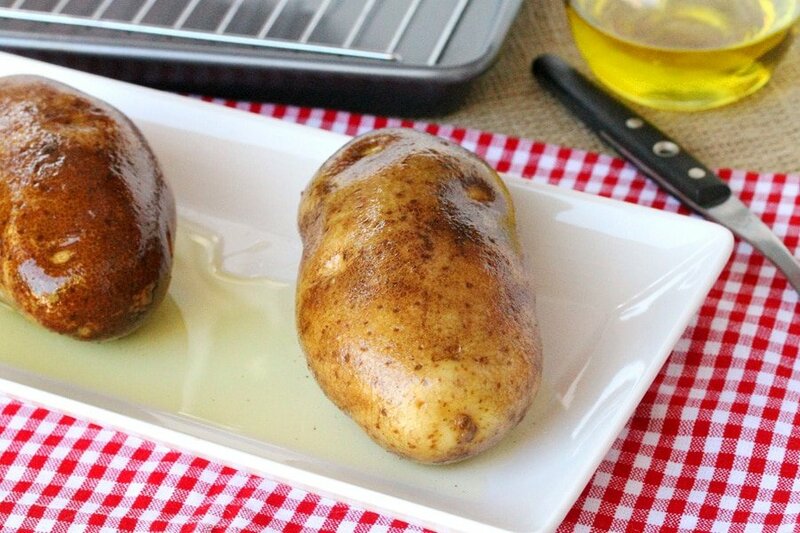 Cover all sides of the potatoes with olive oil or canola oil. 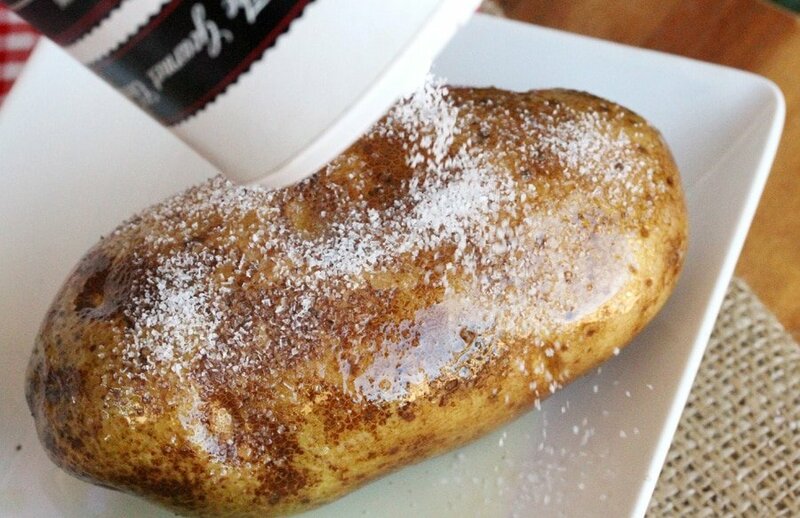 Sprinkle the kosher salt over all sides of the potatoes. 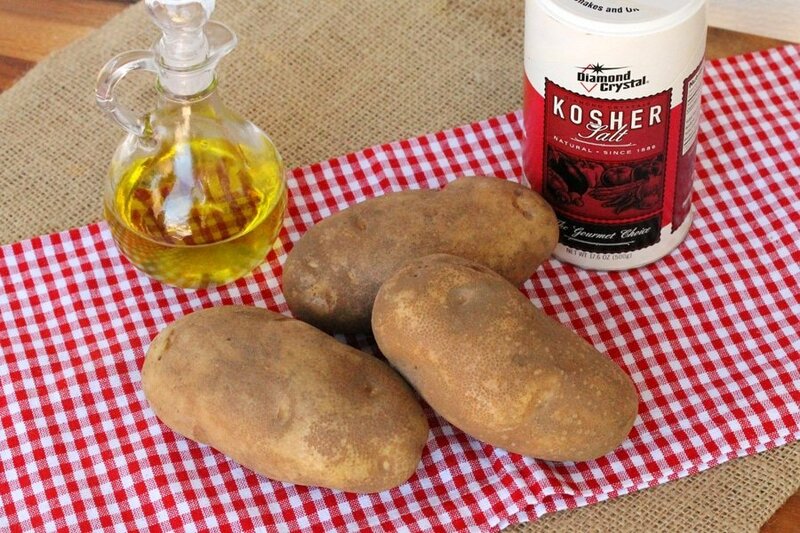 Alternatively, the kosher salt can be placed on a plate and the oiled potatoes can be lightly rolled in the salt. Place the potatoes on a rack with a cookie sheet under it. Bake them uncovered in a preheated oven for about an hour or until done (cooking time may vary depending on the size of the potatoes). 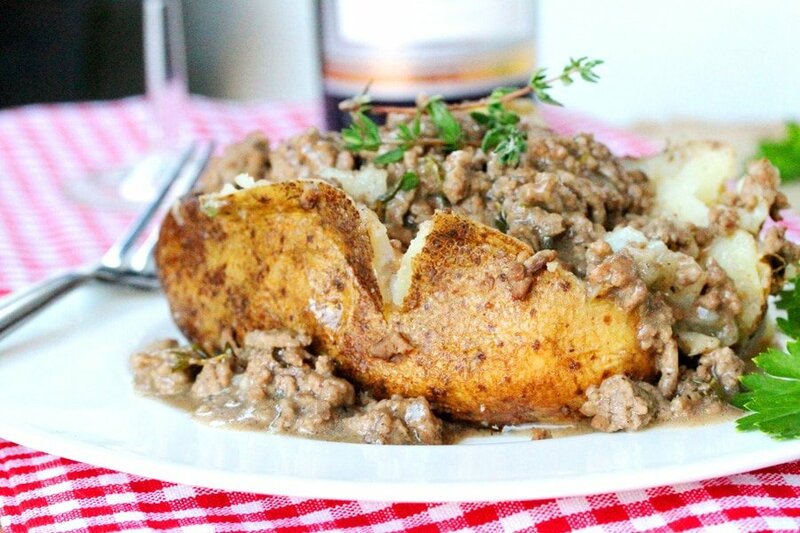 Start making the thyme ground beef and gravy 25 minutes before the potatoes are done baking. 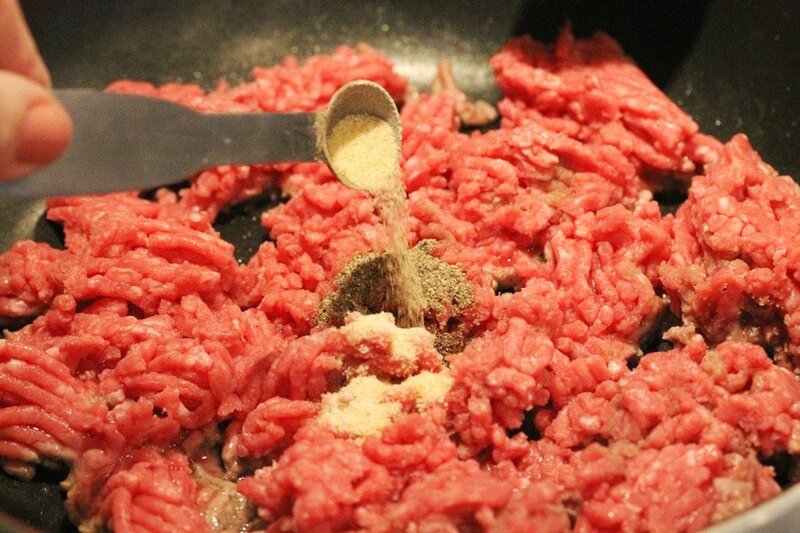 Stir the spices in with the ground beef. 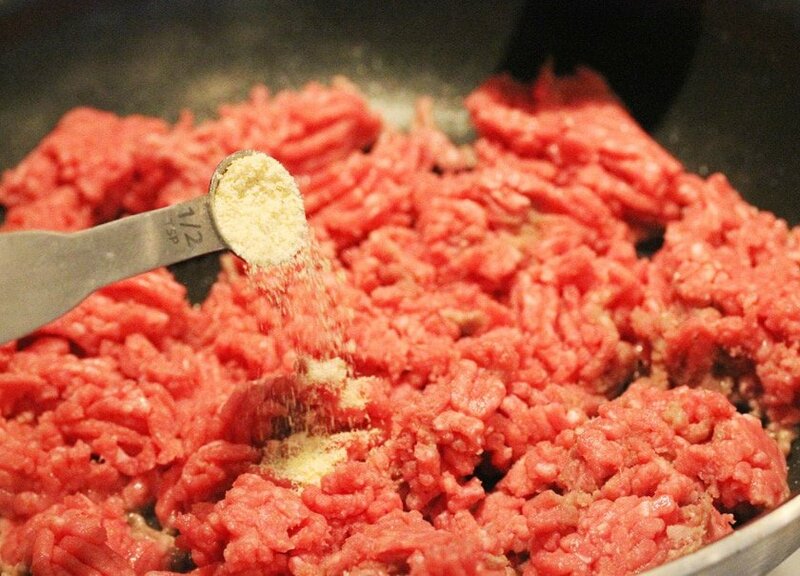 Use a spatula or wooden spoon to break apart the ground beef so that the pieces are all about the same size. 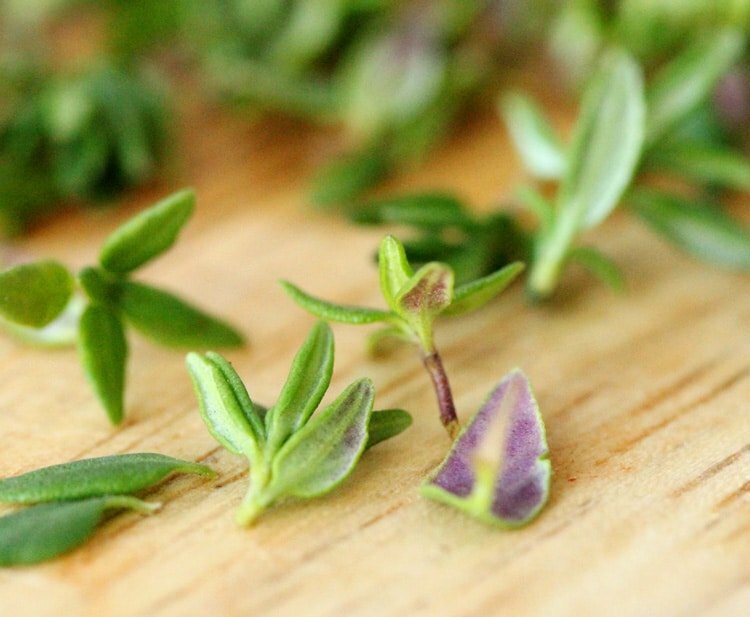 For the Fresh Thyme – remove the leaves from the sprigs of thyme. …no need to chop them. 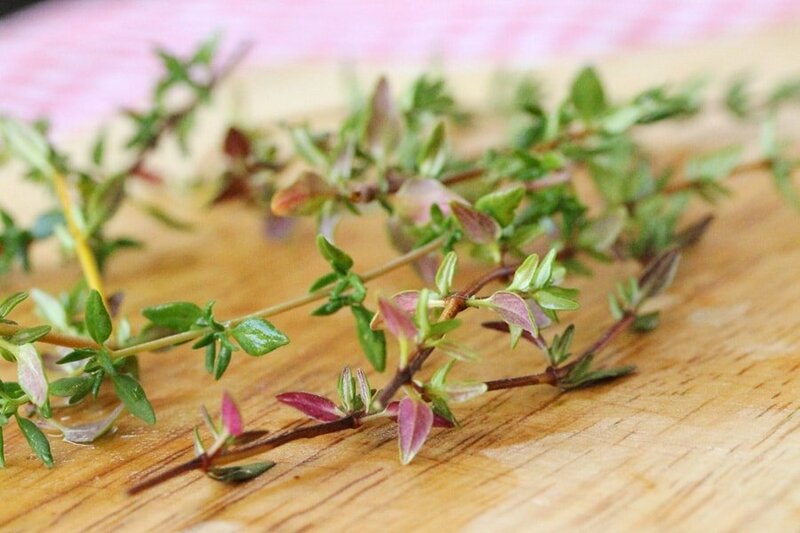 But if the leaves are on the larger side, then chop the thyme leaves. 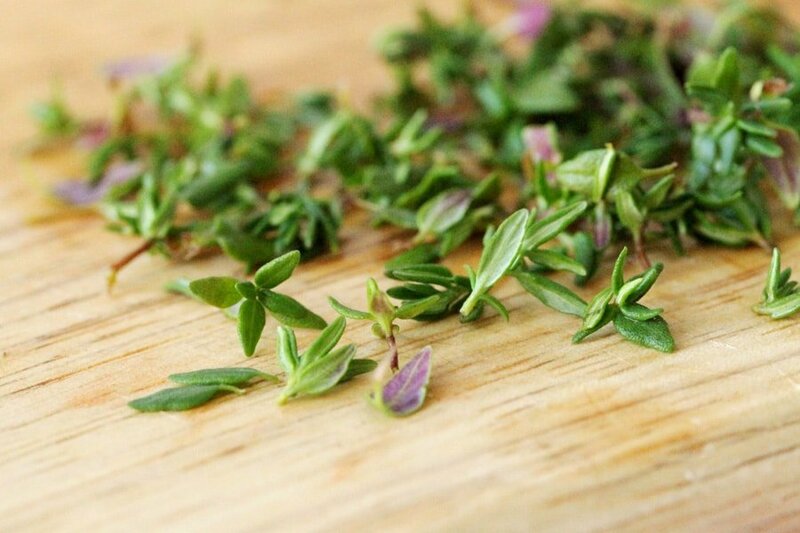 To the skillet, add the thyme. 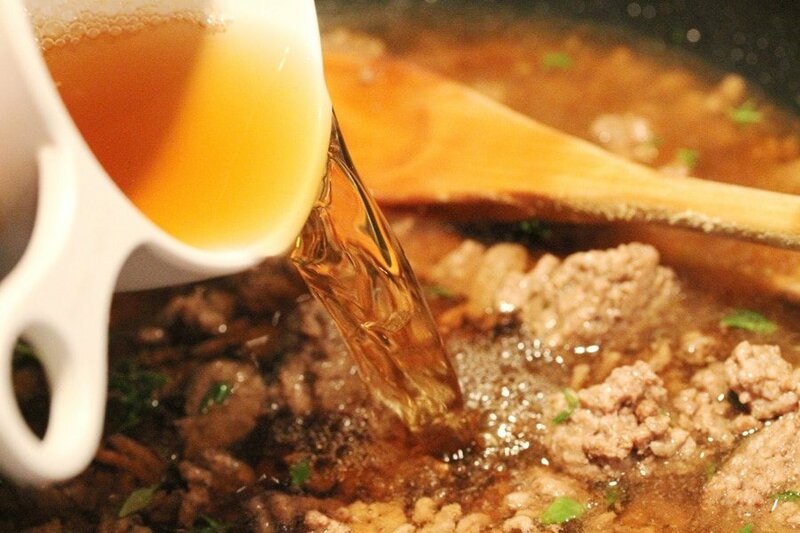 Next, add 2 cups of beef broth and stir. 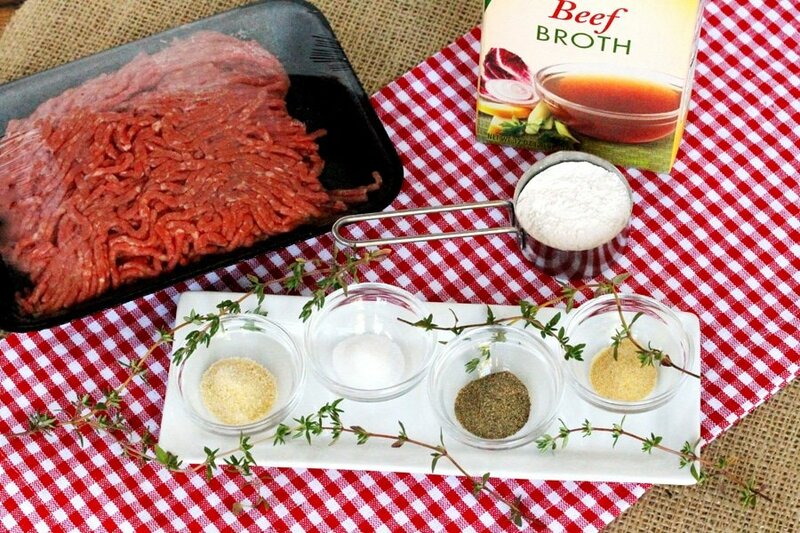 For the Slurry to Thicken the Gravy – In a small bowl, add flour and 4-½ to 5 tablespoons of beef broth or water, so that the consistency is just a bit thinner than ketchup. Whisk together until the flour is completely incorporated with the liquid. 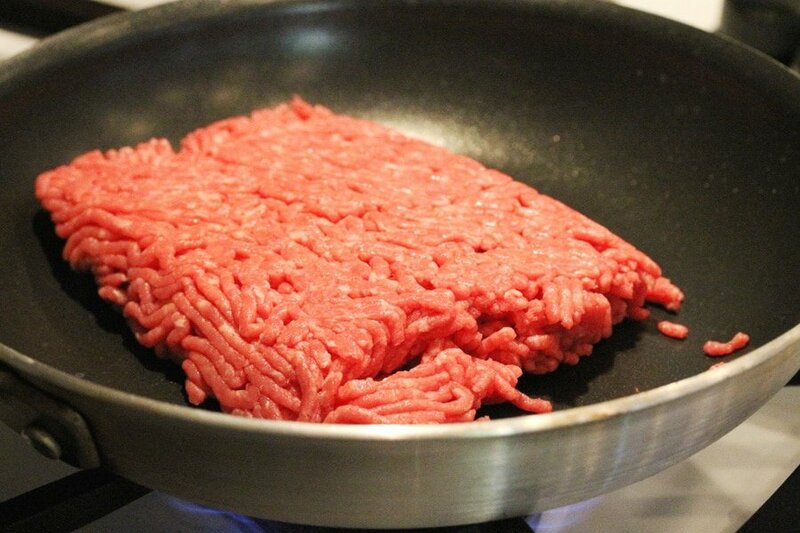 To the skillet, slowly add the slurry a little at a time while continuously stirring. Then add butter, and stir. Let simmer and continue to stir until the gravy thickens up slightly (about 5 to 7 minutes). Transfer a very small amount of the gravy mixture to a small bowl. When it’s cool enough to taste, do a taste test and if needed, add more salt to the meat and gravy mixture in the skillet. …and fluff up the inside with a fork. 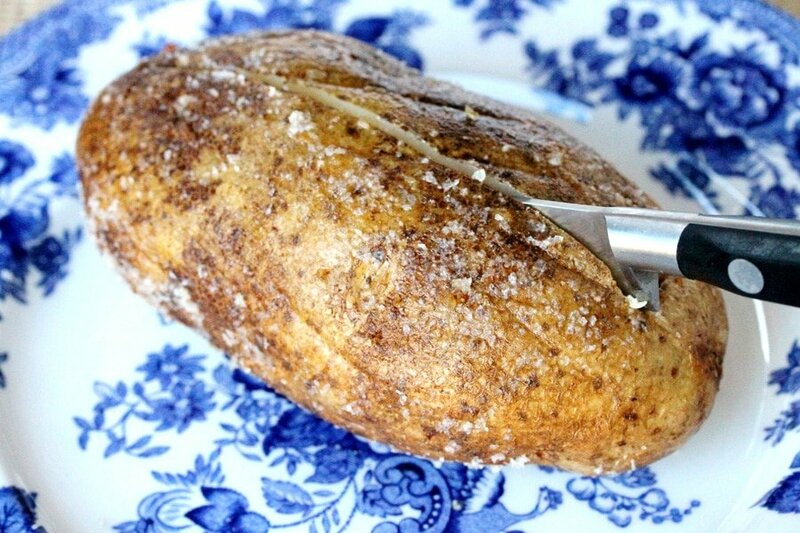 The salt crusted potato skin is soooo good. …all by its delicious self. 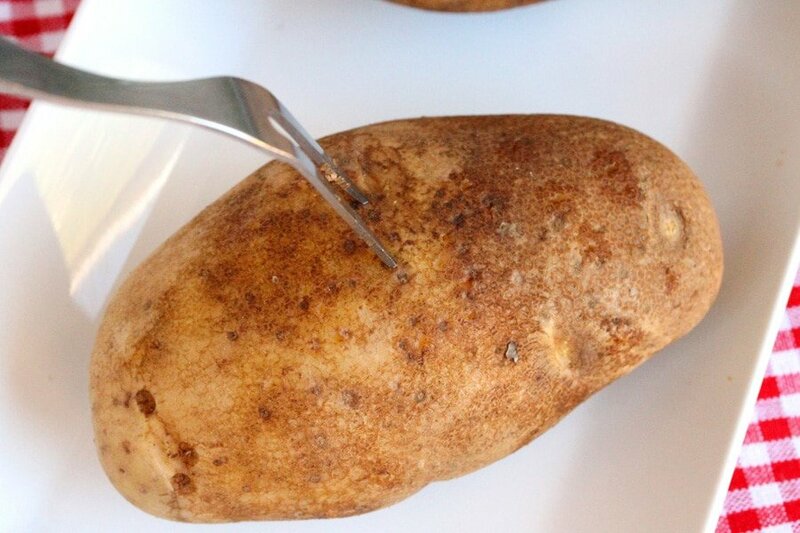 With a two-prong cooking fork, carefully poke holes in each potato. 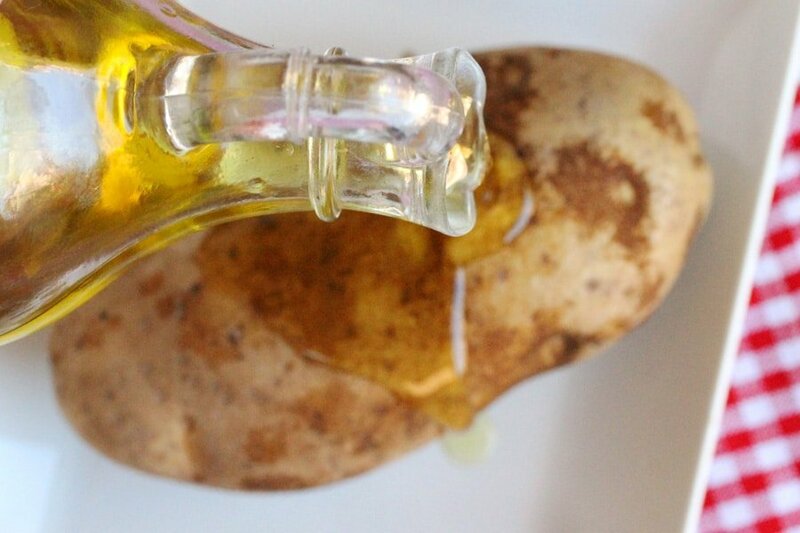 Cover all sides of the potatoes with olive oil (or canola oil). Place kosher (or coarse) salt on a small plate. 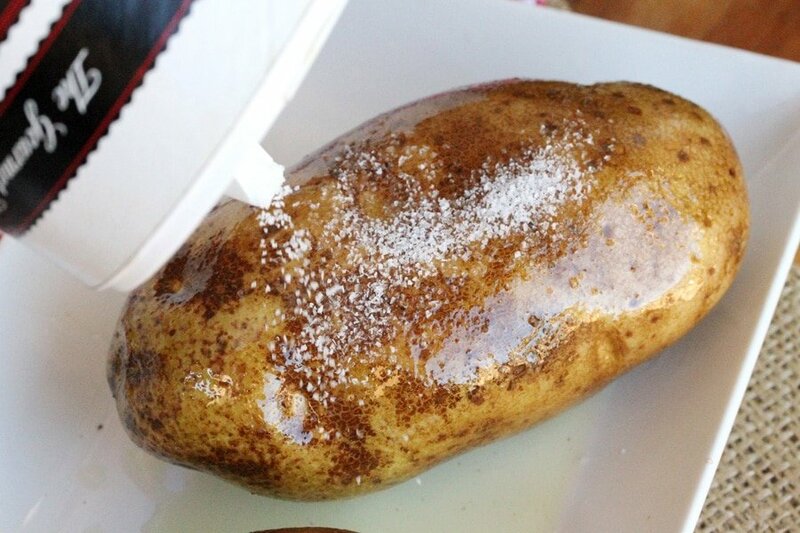 Lightly roll each potato in the salt. 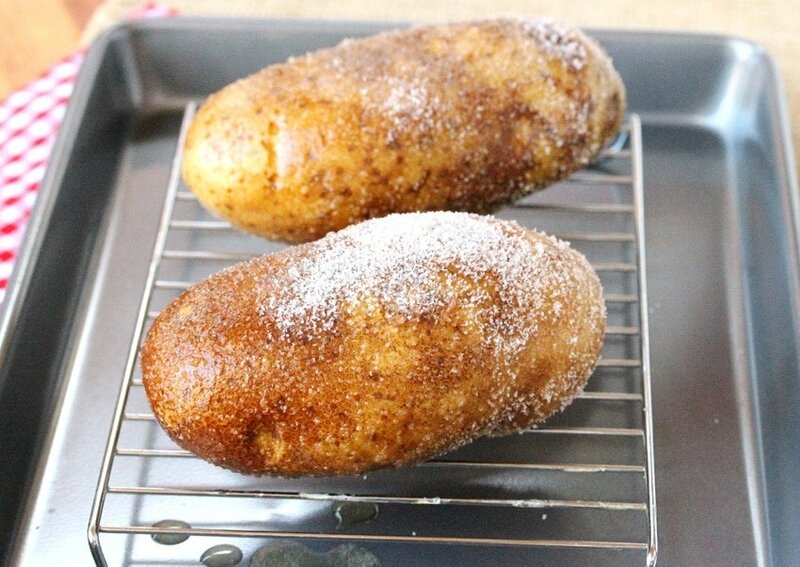 Bake the potatoes uncovered in a preheated oven for about an hour or until done (time may vary depending on the size of the potatoes). 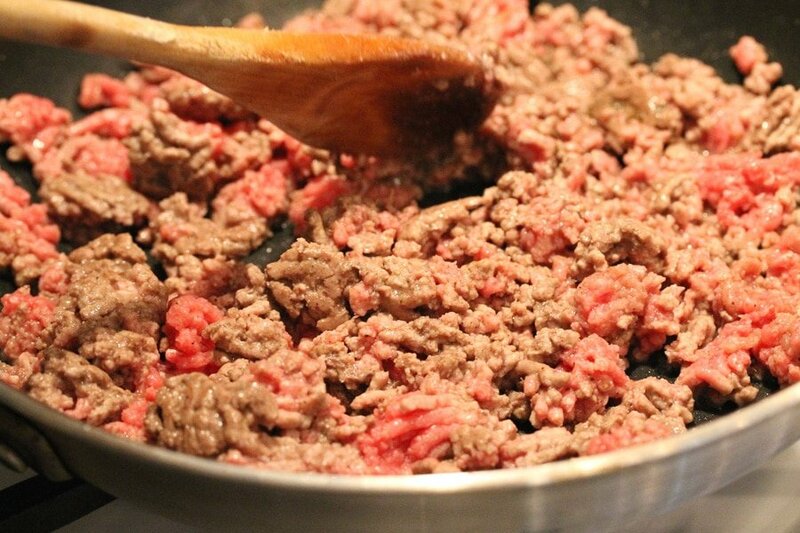 Heat a large skillet on medium heat and add ground beef, onion powder, pepper, granulated garlic, and salt. 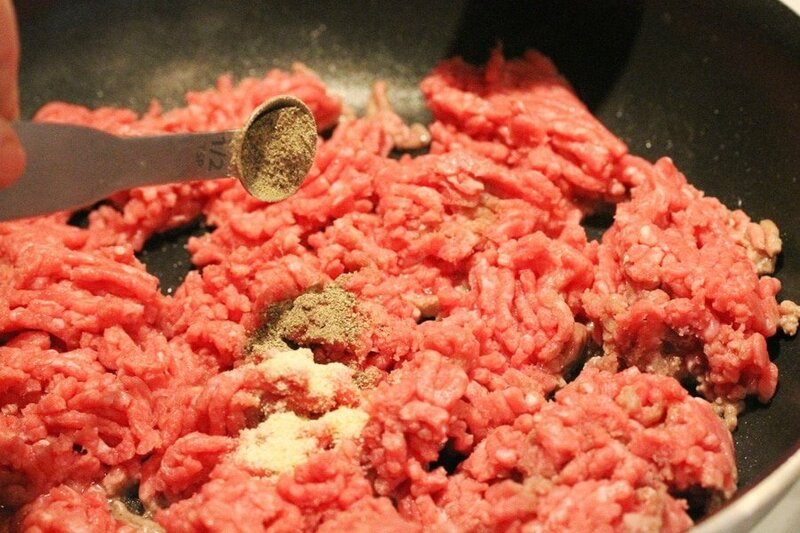 Stir the spices in with the ground beef. 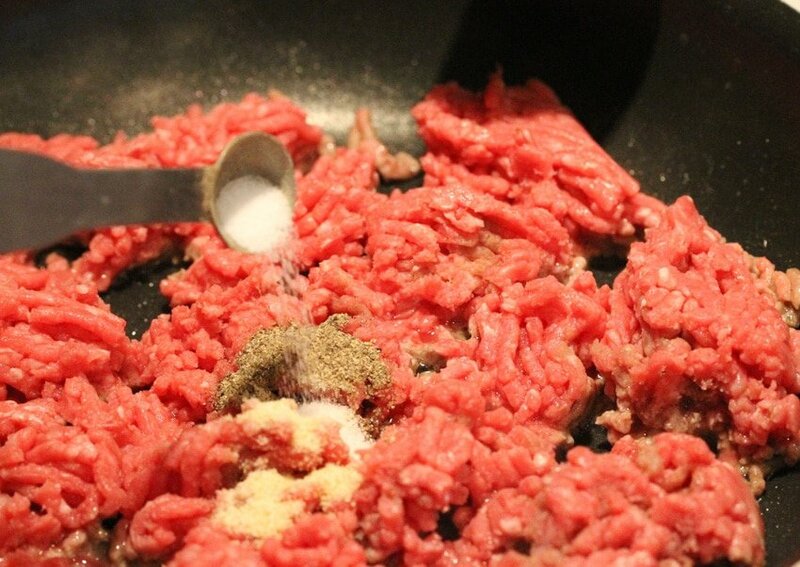 With a spatula, break up the ground beef so that the pieces are all about the same size. 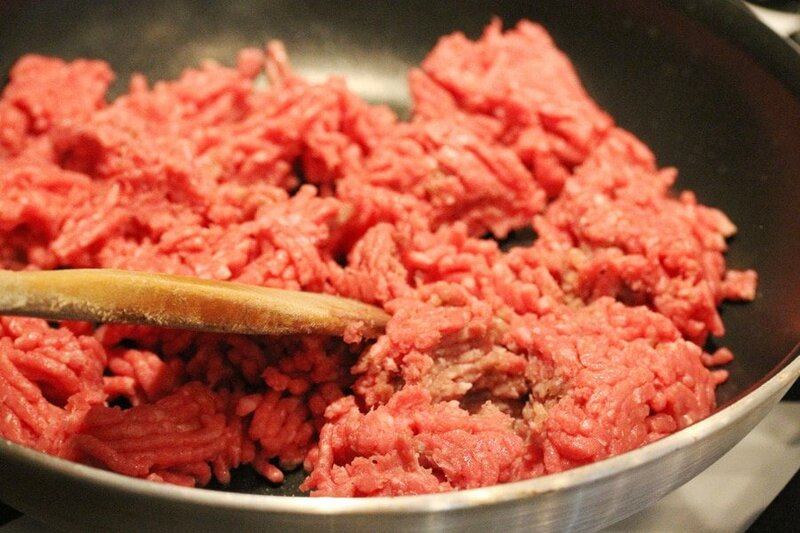 Continue to stir as the ground beef cooks. 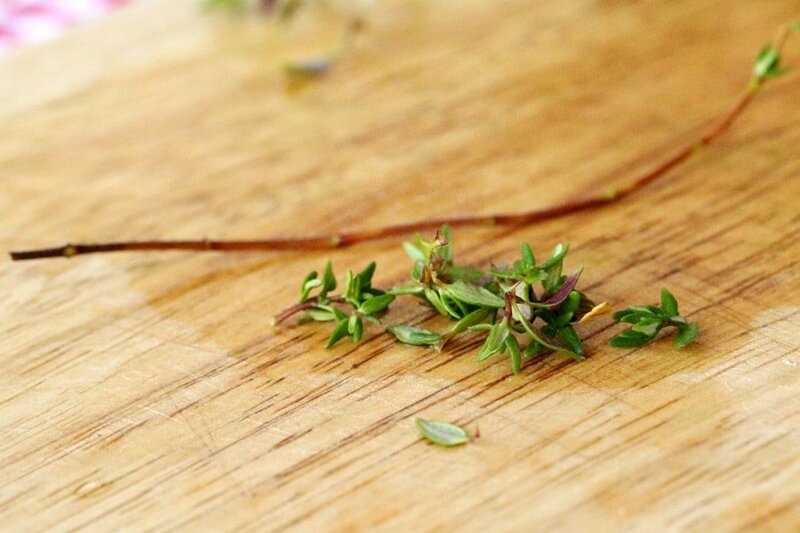 For the Fresh Thyme - Remove the leaves from the sprigs of thyme. If the leaves are small, no need to chop them. 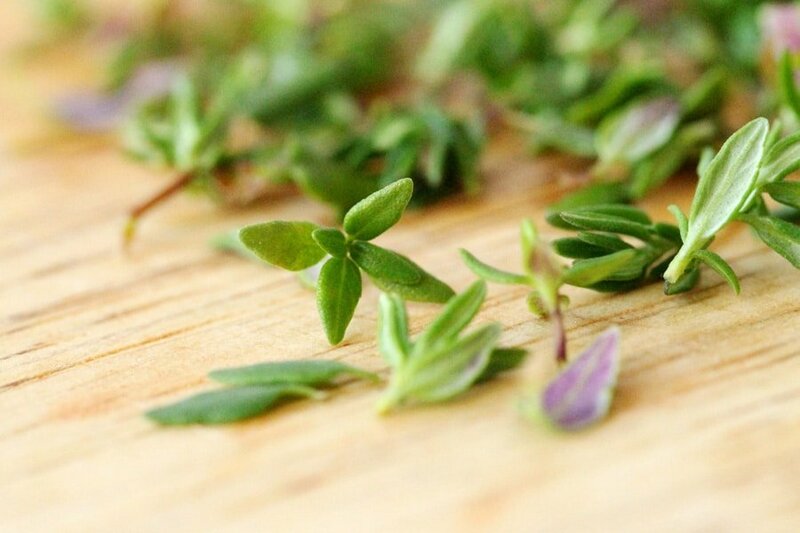 But if the leaves are on the larger side, then chop the thyme leave. To the skillet, add the thyme and 2 cups of beef broth, and stir. 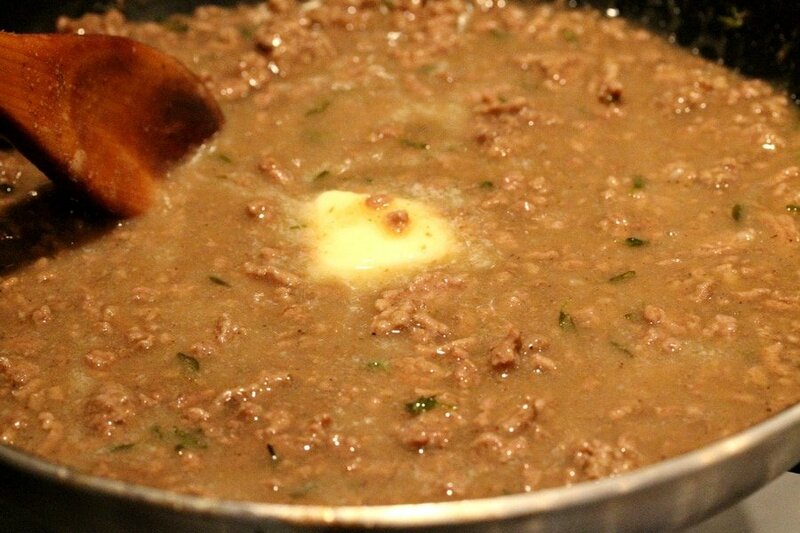 For the Slurry to Thicken the Gravy - In a small bowl, add flour and 4-½ to 5 tablespoons of beef broth or water, so that the consistency is just a bit thinner than ketchup. Whisk together until the flour is completely incorporated with the liquid. To the skillet, slowly add the flour mixture a little at a time while continuously stirring. Then add butter and stir. Transfer a very small amount of the gravy mixture to a small bowl. When it's cool enough to taste, do a taste test and if needed, add more salt to the meat and gravy mixture in the skillet. 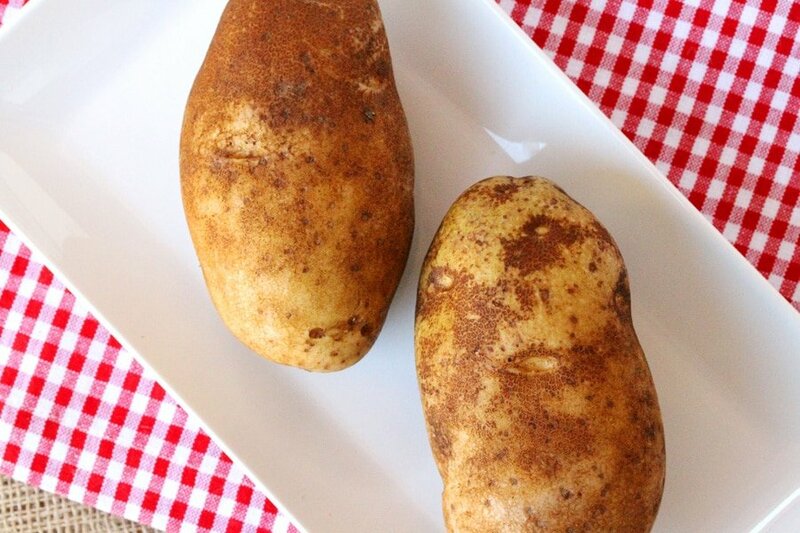 For Serving - When the potatoes are done, carefully cut a slice on top of each potato, and fluff up the inside with a fork. 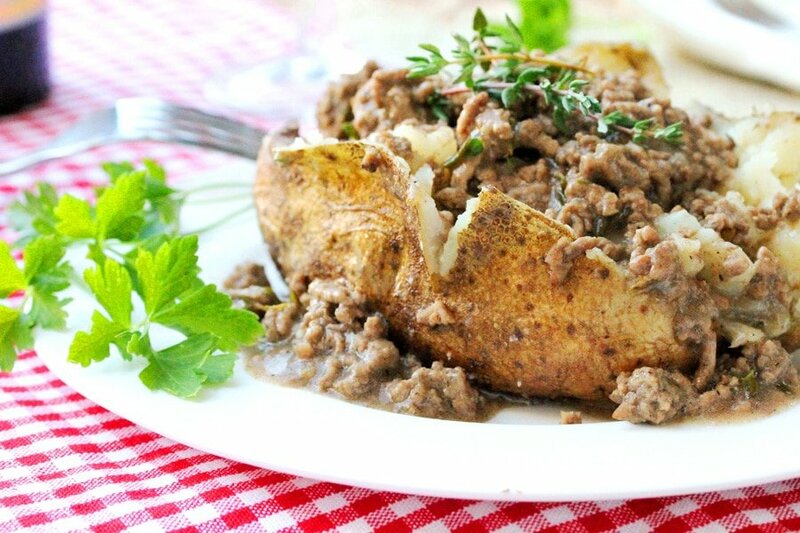 Spoon the warm thyme ground beef and gravy over the top of the potato and serve with a small dinner salad or all by itself. 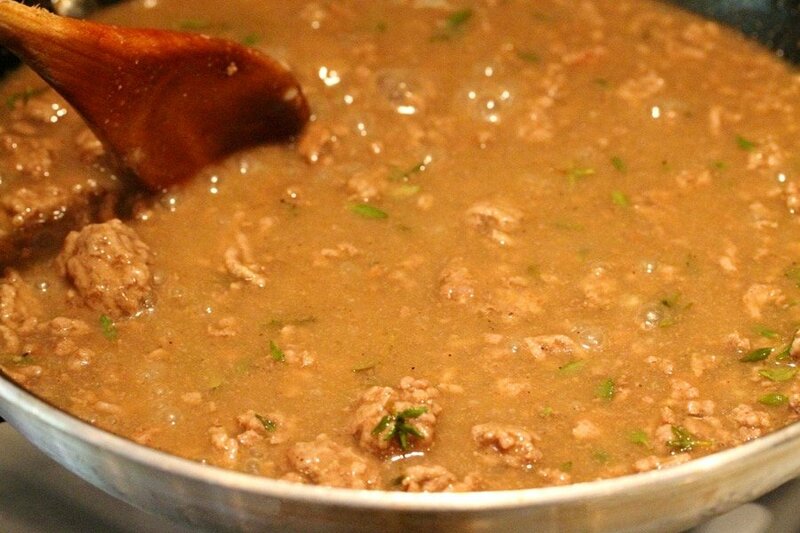 This will be my “go to” hamburger gravy from now on. So easy and delicious. I usually serve it over mashed potatoes, but the baked potato with the salty skin was wonderful. Thanks for the great recipe! Hi Cheryl, I’m so glad you liked this! Thank you for letting me know and have a great rest of the week! Love this recipe! I made it a couple of months back and the hubby and I both loved it. I’m making it again tonight and really look forward to it. 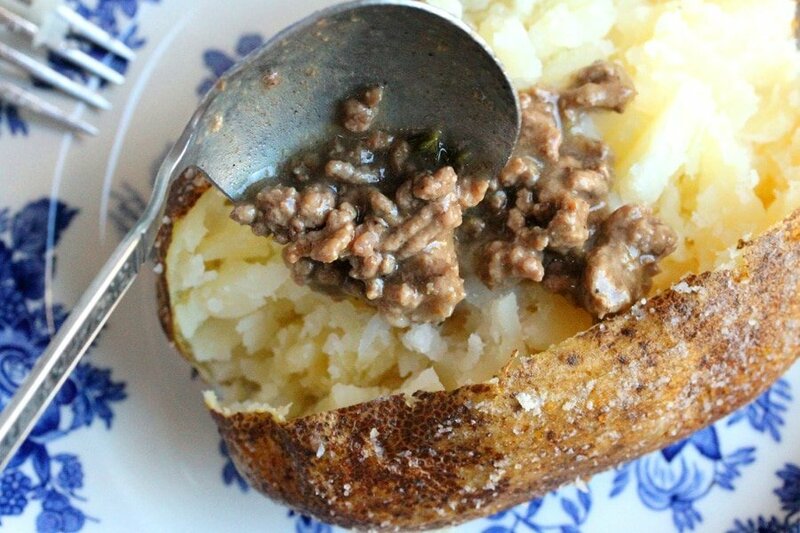 It’s the perfect simple but homey and comforting dinner. Hi Amy, I’m so glad you and your husband liked it. It sure is a simple but homey and comforting dinner. 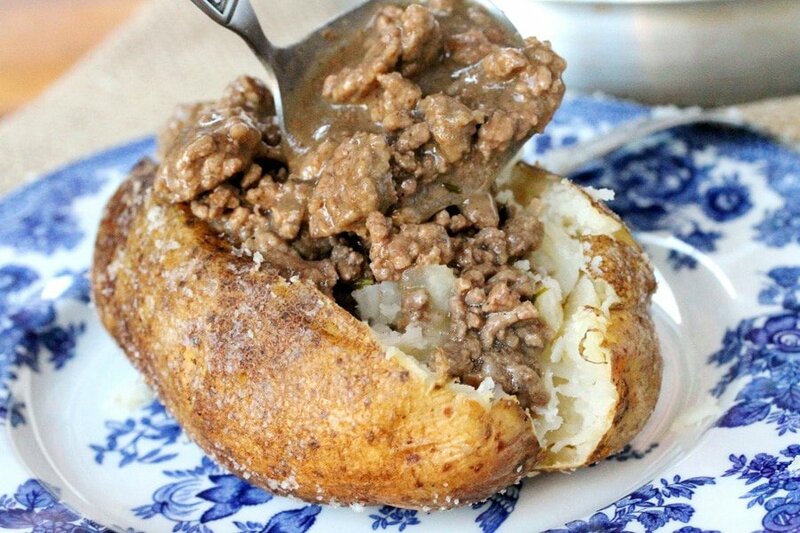 Something about the potato and meat together. Thank you for letting me know and have a nice rest of the week. That. Looks. AMAZING! I LIVE for delicious potatoes and this looks soooo good! I am going to try this ASAP! Hi Sarah, so glad you like it. Have a nice weekend! Hi Bibi, I couldn’t agree with you more! Thank you for stopping by!